BLUF: Use Blogger Sure you can set up a visually beautiful SquareSpace or Tumblr, but when it comes to long format blogging, WordPress and Blogger rule. Both provide free blogging but only Blogger lets you monetize your blog gratis. Not only that, with WordPress.com (which is very different from WordPress.org), you have to pay a $30 premium annually to run an ad-free blog. One reason to pay the premium is that you have no control over the ads that run, and some of them will go against your principles. The blog I run on WP is for people with MdDS, which most often rears its ugly head after a cruise, and WP kept running cruise line ads because its algorithm understands keywords not meaning. By default, Blogger does not run ads on your blog, no upcharge involved. It's one of the reasons they've had my loyalty since 2008. Another reason to love Blogger is that through the power of AdSense, also a Google product, when you let ads run you earn money! You can control the size and type of ads that runs, where they appear on your blog, and even do some blacklisting. I don't let pesticide or exterminator ads run on my site, for example. Mostly you only earn pennies per ad, sometimes just one, but if you consistently write quality content and your blog sees regular traffic, the pennies add up. When they add up to $100, Google sends your first payment. I think I have two readers so it took me 9 years to earn it, but my check is in the mail! Don and Julie, sorry about serving up ads to you. To make it up, for an ad-free future I highly recommend the AdBlock extension. It's free but I like it so much, I've even donated to them – while working in the advertising industry. Nine years of blogging and 357 posts. That works out to $11.11/year or $3.57 per post. Unfortunately, considering the investment I've made over the years to provide the consistent, quality content mentioned earlier, in reality I'm quadruple digits in the red. The things we do for our bees, right? Speaking of, here is the long promised video of Marty Hardison administering a live bee sting so that I can get back into the business of keeping bees. I recorded it in slow-motion for you but YouTube is serving it up in real-time. Sorry for that, and for it not being closer in. I was recording with my phone in my left hand and an ice cube in my right. I was able, however, to grab a still of the stinger being ripped out of the bee, which you can see over on IG. For the record, I don't recommend taking a sting to the calf (or any muscle-y area), but I would not have been able to record a live sting to my bingo wing. The things we do for our readers, right? I arrived at Marty's house confident that 4 years of allergy shots had lowered my venom sensitivity and indeed, initially, I had very little reaction. No pain, no itching, barely a welt. A few hours later had a bit of a cankle. This is classic of a late phase reaction but this type of swelling is considered "large local" or in other words no systemic reaction. Yay! I'm so close to keeping bees again, I can taste it. And of course it tastes sweet. Marty also put together some bees-to-go using queen cages but, well, I'll just say that what I did with them is a long story for another time. Combining my experience with VIT with how allergists are being advised to cope with the venom shortage, and the apparent fact that fresh venom is more potent than reconstituted venom, I'm going to wait two months between live stings. 1 Journal of Evidence Based Medicine and Healthcare, "A rare case of survival of honey bee sting victim with more than 1000 stings." Congratulations on your first check! Hope that it's the first of many to come! Even better news is your reaction to the bee sting! Hooray! Fingers crossed that you'll be in bees again soon! @Julie D When it is time to stock our hive, Marty even has a source of bees for us already. How awesome is that?! His neighbor runs TBH the same size as ours, and he says they are just "packed." She subscribes to the "bee guardian" school of beekeeping so, even though Marty says her hives are badly cross-combed, I hope she will be willing to split one of her hives in the Spring. Marty is hoping to increase availability of locally adapted stock and is working at queen rearing. I've never even noticed the ads - guess I'm not their target audience. I'll bet you find out you have more subscribers than you think. I found a link to my blog on someone else's recently! Congratulations on your bee sting success! I'm so happy for you. BTW, I'm taking over a bee yard of someone who uses Hardison hives next spring. She's the one who first taught me about top bar hives and knows Marty well. 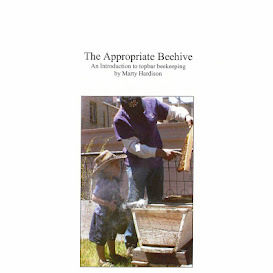 I'm also going to try Marty's method for queen rearing next year. Maybe we can start a little community of providing locally adapted queens! Thank you, @Don. Marty will be thrilled if you start producing locally adapted queens. It will be quite a while before I can get into the queen rearing game, but I am considering using requeening and brood breaks as part of my varroa management. Have you looked into On The Spot (OTS) queen rearing? Instead of grafting, you scrape away the cell wall below ideal eggs. Sounds like something I can handle. @Don Almost all my topbars have comb guides, and I learned the hard way to not just flip one over and use the flat side. I can see having dedicated bars for a full-on queen rearing setup, though. Marty uses a technique similar to OTS. He simply cuts out the comb entirely, so there is a v-shaped opening below the chosen egg(s). As for seeing eggs in the first place, I keep a big magnifying glass in my inspection tools, just a cheap plastic one. I thought about the similarities between OTS and Marty's method after I made that post (and read more about OTS). I have a bunch of bars that I haven't put guides on yet, so will probably use those. Good point about flipping the bars over. Should be an adventure next year! I also keep a flashlight in my box which highlights the cells and makes eggs easier to see. With my progressive lenses, I can never get the right magnification distance through my veil. I have some computer glasses for work for seeing close up, but I always forget to bring them home before I do my hive inspections.